Preston (QLD) recently supplied two cranes from their fleet of mobile cranes and crawlers to access a space-restricted area during the construction of ABC’s new Queensland headquarters. Housed on one of Brisbane’s most prized pieces of real estate, the Southbank Parklands riverfront, the new HQ offers panoramic views across the water to the CBD skyline. Leighton’s sought a versatile solution from Preston to overcome the problem of narrow driveways that limited access to the site. 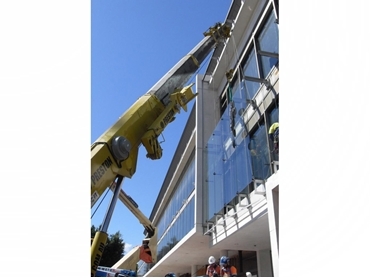 A mobile crane was required to install an external glazing façade to the ABC headquarters. As a preferred supplier to Leighton’s for a number of years, Preston (QLD) was able to provide two mobile crawler cranes to solve Leighton’s problem. The Unic URW-706 and Maeda MC-785 cranes employed their excellent lift and reach capabilities to perform general lifts and installation within the area, maintaining excellent manoeuvrability and flexibility throughout the process. Preston also supplied four loading platforms to ensure safe and efficient strip and fit out programs during the project. The Preston Group offers a large fleet of mobile cranes and crawlers in Australia to enable companies to carry out narrow access area construction. Preston’s fleet includes over 30 mobile cranes and crawlers across three branches in Sydney, Melbourne and on Queensland’s Gold Coast.